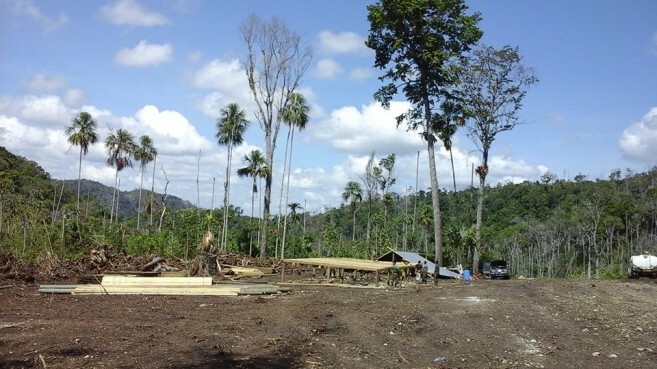 The illegal encroachment of Guatemalan peasants into the Belize Chiquibul National Park continues to escalate as new findings have confirmed agricultural activity up to 2.7 kilometers within Belizean territory. The protected area is situated in the Cayo District in western Belize and borders Guatemalan territory. The latest discovery was made by Friends for Conservation and Development (FCD) south of the national park in an area known as Cebada, revealing plantations of beans, corn, and bananas allegedly planted by Guatemalan farmers from nearby villages along the Belize-Guatemala border. It is alleged that after Guatemalans voted ‘Yes’ on the referendum to take the territorial dispute with Belize to the International Court of Justice (ICJ), many of the residents along the border have been informed that Belize is now Guatemalan territory, and that works are underway for them to start occupying parcels of land in the Chiquibul area. In a press release issued on Wednesday, May 9th the FCD indicated that they had been reliably informed that after the ICJ referendum held on April 15th in Guatemala, several rogue leaders have been visiting the local communities next to the Belizean border. These governmental leaders have been informing villagers on the Guatemalan side that Belize has now been recovered and a list is being developed for those who can occupy the land in Belize. In addition, it has also been reported that such leaders have been asking for money from the poor farmers in order to facilitate their entry on the said list. Furthermore, the findings of fresh survey lines opened and marked in the Cebada area are believed to confirm this allegation. In the recent months, aerial reconnaissance had shown the extended damage being made on the Chiquibul landscape as Guatemalan farmers allegedly continue to clear acres of land in the national park. But according to FCD, getting personnel on the ground to tackle the problem has been very difficult. 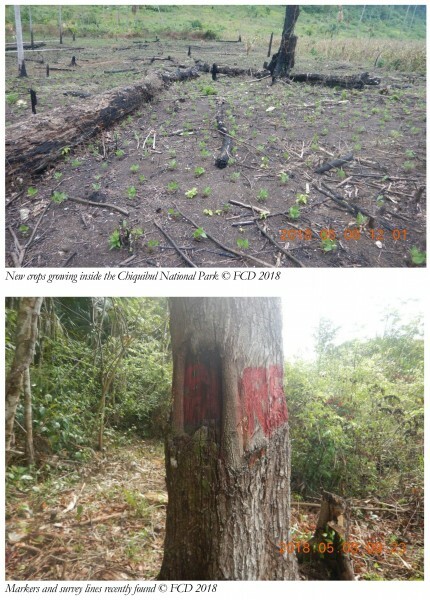 Meanwhile, the unlawful activities continue threatening one of Belize’s largest protected habitats for fauna and wildlife. The FCD claims that the complex array of human activity in Cebada has been active and led them to recommend the installation of a Conservation Post to monitor this urgent situation. With funding from the Government of Belize, the Post is finally becoming a reality as construction has begun. FCD is confident that it will help reduce the on-going cross-border agricultural expansion in the southern Chiquibul area. Other recommendations from FCD include the bolstering of patrols in the area and the involvement of the Ministry of Foreign Affairs. The participation of the Organization of American States is also called upon for the assessment of the constant human activity. In an effort to raise more awareness about the dire situation, FCD is reporting the illicit activities to its partner environmental organizations in Guatemala. 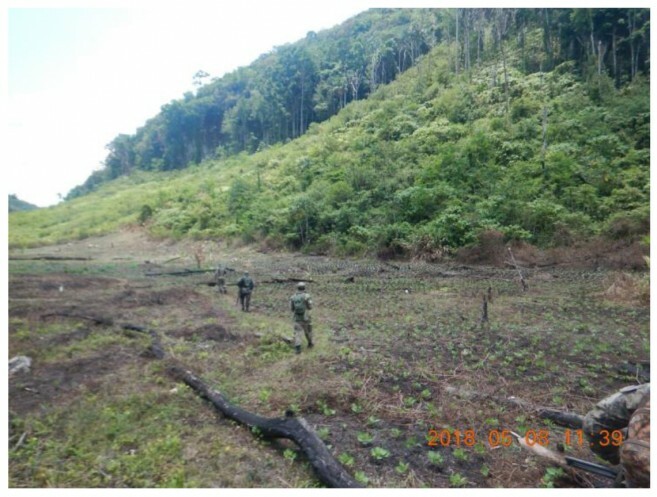 In addition, the organization makes it clear that persons found inside the Chiquibul forest involved in such illegal practices like destroying the forest, farming, poaching, illegal entry, and occupying and settling inside a protected area, will be detained and handed over to the correspondent authorities for charges to be levied. The FCD is hopeful that GOB would look into this matter and implement these strategies to alleviate the presence of illegal Guatemalans and conserve the integrity of the Chiquibul National Forest. This protected area of 1,073 square kilometers is rich in natural resources providing up to 40% of Belize’s water. Additionally, is also home to a spectacular array of wildlife like scarlet macaws, curassows, Brockett deer, peccaries, and Belize’s national animal the tapir among other species. The forest is also teeming with an abundance of different trees and plant species including the Mahogany tree, which is Belize’s national tree.